Posted: Wednesday 6th July 2016 in Paid Media, Retail Strategy, Thought Leadership. Data drives everything we do here at Summit, and it is no different when it comes to our approach to planning online marketing through peak. 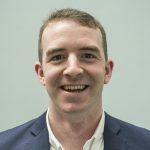 In this article we will share some practical tips and techniques that will help maximize the return on investment (ROI) of your online marketing budget and improve business profitability through peak. Here are some simple steps that can support businesses, big and small alike. 1. Annually – use category profitability to help you get the most bang for your marketing buck and category demand to help you identify where there is most trade to be won throughout the year. The example below highlights how category A is considerably more reliant on peak, with 50% of the annual budget allocated October – December, compared to only 30% in category B. 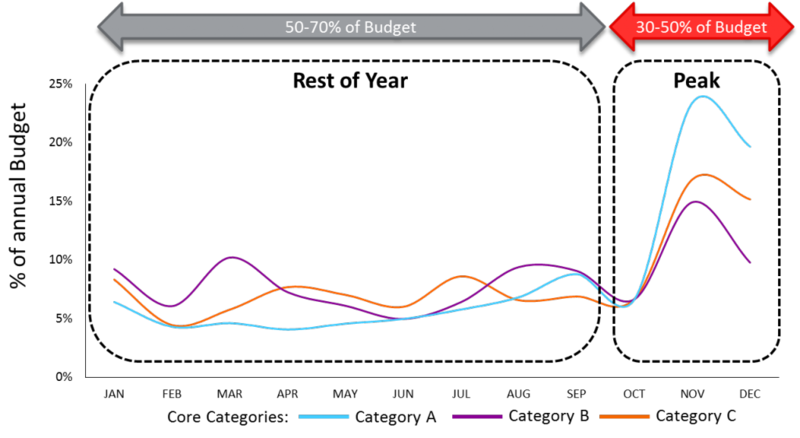 This graph compares the allocation of online marketing budget over the course of a year, between a number of different categories – profitability and demand in category A is more driven by the peak period therefore a greater % of marketing budget has been allocated. 2. 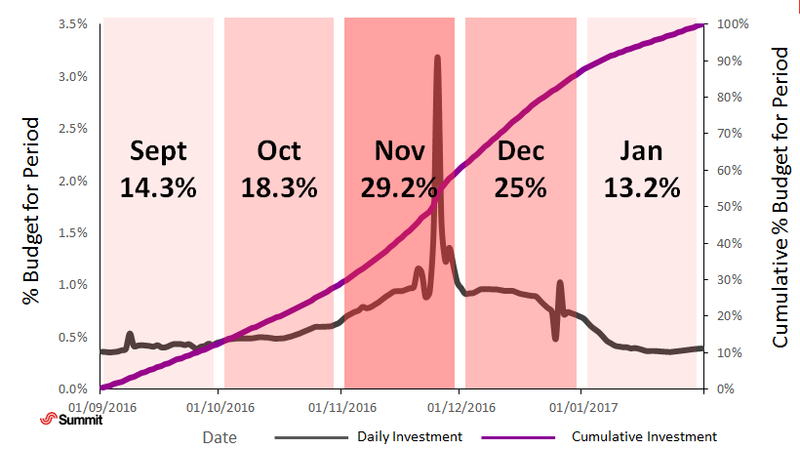 By week – once you know how much budget you should invest in peak we recommend using sales and cost of sale data to break the budget down by week delivering the best ROI. As illustrated below, the investment into Black Friday week is more than three times as high as any other week. This graph highlights how much budget should be spent in the example category by month and by week as well as cumulatively through the period. 3. By event – eg Black Friday – use customer behaviour, such as visits and device conversion, from similar past events to predict how customers will behave. 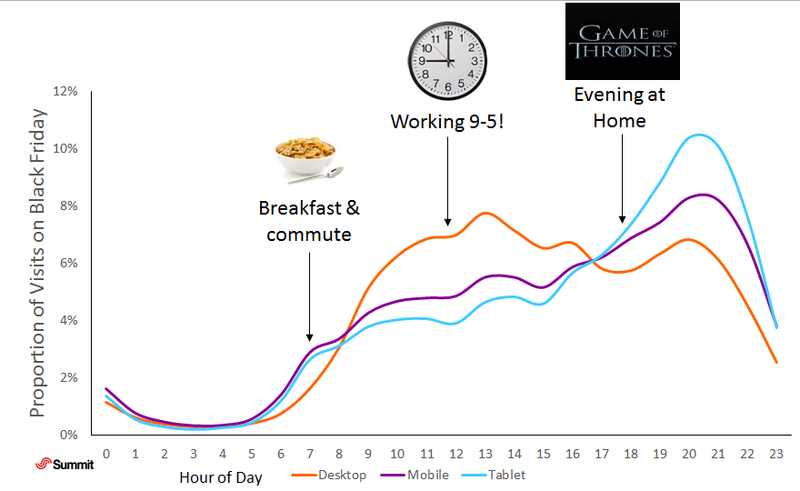 As shown below, device usage changes from; mobile in the morning, desktop during the working day and tablet in the evening. This graph highlights the % of visits to the site by device by hour. Consider peak in your annual plans and make sure you allocate the right amount of money by category. peak will be more important to some categories than others so we recommend bespoke annual budget plans for each. Use sales and marketing costs to plan budget by month, week and day, so you have budget to take advantage of the opportunities ahead of you – squeezing every drop of ROI over the period. Use in day behaviour to win the key days and events in the calendar, detailed day plans will help you stand out and be a reason for customers to return later in the season. On the face of it customer planning seems mighty challenging as behaviour can appear erratic and unpredictable. Are customers on a research journey or a purchase journey? Are they buying for themselves or for others? Is this the main present or a stocking filler? This illustration highlights how a number of behavioural data points can be combined to build a clear customer plan for the peak period. What to do – help them find the right product information. The process of planning with data doesn’t have to be arduous or technical. Here at Summit, we have developed an approach to peak that can be replicated by any online retailer and is proven to drive improved ROI and performance with customers. Download our quick guide when you sit down to plan for peak 2016, or alternatively contact us for more information.